Our world leading range of Classic air purifiers provides trustworthy solutions for a healthier life for you and your family. 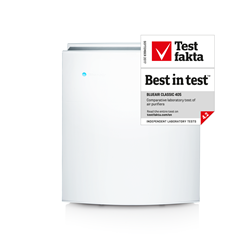 In fact, they're so trustworthy that Nordic independent test institute Testfakta has awarded the Blueair Classic 405 “Best in test” for highest capacity and performance. But you can trust all our Classic air purifiers to remove allergy and asthma triggers and other airborne pollutants from your indoor air. And the Classic is Wi-Fi enabled, so adjustments can be made anytime, anywhere via the Blueair Friend app. It also operates with less energy, is more quiet and cleans a significantly larger area faster than previous models. *The test included air purifiers on the Nordic and UK markets. View the test in PDF-format here or go to Testfakta.com.